Back in April, Zach and I went on a CleanTechnica tour de Southern California centered around the Tesla Model 3 unveiling event. While in line to lock in our Tesla Model 3 reservations at the Santa Monica Tesla store, we met Roger and Matt Pressman from EV Annex in person. Since then, they have sent over a few of their custom-designed and custom-built accessories for the Tesla Model S for us to review (like the Cubby Compartment). Second in line for a run through the paces was the Center Console Insert (aka CCI). One of the only things that had consistently bothered me about the Model S was the awkward storage situation in the main cabin (there isn’t much) and with the Model S having such solid acceleration (aka boost), trying to store anything in the vacuum of space that in a normal car would be home to the center console is a challenge. In a normal car, the center console is the place where my coffee mug typically goes, a pair of sunglasses, hand sanitizer, and other important car things. But in the Model S, it’s just a big trench that can’t even hold a book without letting it fly out in one direction or the other at the first sign of acceleration … so I was really looking forward to the EV Annex Center Console Insert and its promise of adding storage and a few ergonomic cup holders to the cockpit. The EV Annex Center Console Insert was purpose built to solve this exact problem. Available in the same upholstery options and trim combinations as the Model S, the CCI aesthetically blends in perfectly with the interior of the Model S. When it arrived, I set it out on my counter and just played with it and looked at it from every angle to get a good feel for it. I quickly grew to appreciate the build quality and accuracy with which it matches the stock finish in my Model S.
Several features immediately stood out to me — the sides of the CCI have a nice stitching pattern on them that you quite honestly won’t see very much after installation. I’ve had mine installed for a few weeks now and haven’t seen the stitching since I installed the CCI with the exception being when I’m vacuuming the floor mats or looking for lost legos. Being a custom-built aftermarket accessory, I continue to be very impressed at just how well it was designed and built. It’s clearly the product of many hours of planning and product design, and as such, fits in well with the beautiful interior of the Model S.
The basics of the install are to put the wide end of the CCI towards the front. Before you slide it in, take note of how the front of the side panels of the CCI are flexible. That’s by design and allows for the CCI to be wedged into place without damaging the CCI or the car while also holding it securely in place. Pro Tip: Be sure to remove anything you had in the trench prior to starting the installation — especially anything plugged into the USB ports! Angle the front of the CCI down into the gap and gently slide it forward, which will allow the CCI to gradually work its way into the trench of the Model S. And voila! It’s as simple as that. Just a few minutes after the Center Console Insert arrives, you’re already enjoying real center console storage and an ergonomic cupholder or two. The EV Annex CCI has 3 primary areas for storage of your goodies — a phone holder that you can wire up with a charging cable through an integrated cable handler, a cupholder (that is actually rather ergonomically friendly to use! ), and a larger, concealed storage area with a sliding cover. The sliding storage compartment is a bit on the small side vs what most conventional center consoles can hold but easily holds the essentials. Mine has become the home to my J1772-Tesla charging adapter which I use perhaps once per month, a pack of gum, and a screen cleaner for the giant touchscreen. The sliding door keeps the mess out of sight and also provides a nice spot to put temporary storage items like a letter that needs to be mailed, a passenger’s phone, or a snack. The door uses neodymium magnets to “latch” in place and, as it’s slightly recessed, smaller items can safely sit on top of the door without fear of being launched into some random part of the car during unavoidable boost-filled moments. The cupholder is much easier to access than the two factory cup holders which, to be frank, have always felt weird to me — they’re in an awkward spot in the car, the two sliders that can be moved forward to serve as armrests frequently bump drinks I put there, and I don’t like putting drinks in an area where they would drip into the USB ports (which are directly underneath the factory cup holders). As such, the additional cup holder in the CCI is a welcome addition. Though, I personally would have preferred it to be 2 cup holders side by side, because most of the time the driver and passenger end up with drinks from the same cafe/restaurant/juice shop. 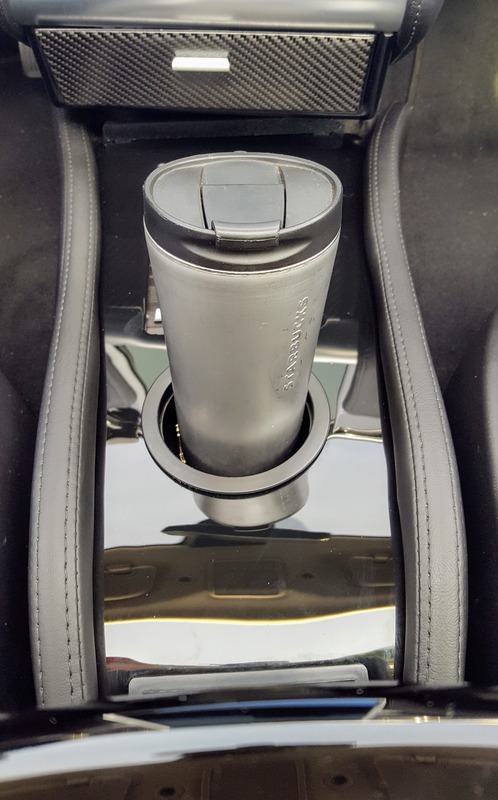 The cup holder has a rubber insert in it that provides a super snug hold on whatever it’s tasked with holding onto. This rubber insert can also be removed for cleaning. It often gets a better hold on my coffee mug than it has on the CCI and comes out to play … which makes for a good reminder to give it a quick cleansing. The CCI also has an optional second cup holder, but it comes with a caveat, as it takes over the slider storage compartment — a tradeoff I’m not willing to make, though it’s great to have the option for those who prefer more cups and don’t want or need the storage. Back by the USB ports in the Model S, the CCI has a phone cubby that you can even plumb up with a charging cable for a smartphone or mp3 player. The pocket is admittedly not the most convenient to get a phone in and out of if you have to plug and unplug it every time, so I added my own hack: The addition of an inductive (wireless) charger to the cubby and — BAM! — now I just drop my phone in the pocket and it can stream my music over bluetooth while charging with almost no effort required. Beautiful! Much like interior options in the Model S itself, the Center Console Insert price depends on the finish selected — and there are a ton to choose from! The stock piano black trim starts at $529, with the real carbon fiber trim holding the high-water mark at $669. When the CCI first came out, it was the only game in town for those who wanted a center console. Though, Tesla has since released its own center console option — note that it is priced much higher than the CCI. For my needs, the EV Annex Center Console Insert was a perfect fit — not too expensive for what you get, great build quality, and the core features I was looking for. On top of that, the EV Annex team is great! Great customer support, great guys running the place, and great products (they make and sell tons of Model S … and X … and soon Model 3 accessories). I highly recommend the CCI and the team over at EV Annex. For more on the EV Annex Center Console Insert, check it out over at the Center Console Insert page at EVAnnex.com. 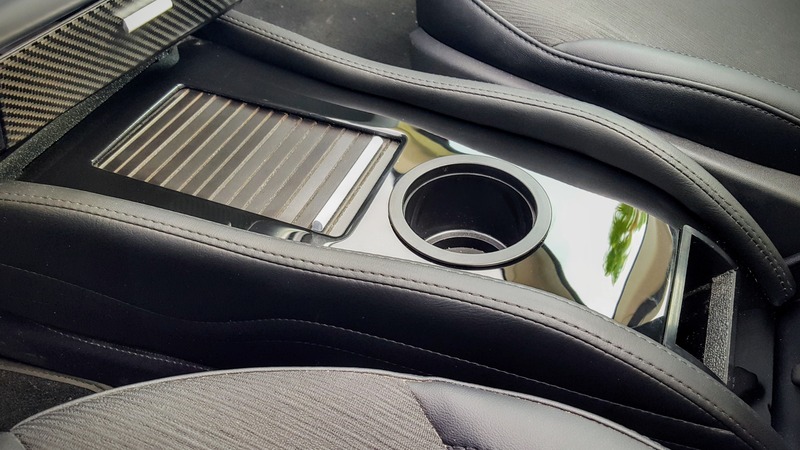 Disclaimer: The Center Console Insert was provided free of charge to CleanTechnica for review but we are under no obligation to write anything — positive or negative — about it or EV Annex.